There's a $22 billion opportunity to reach consumers on their mobile devices, KPCB's Internet Trends 2016 report shows (check out slide 45), so you'd best be putting your ad spend into mobile marketing. But mobile is a vast and complicated beast. Brands and marketers need to know, not only the ins and outs of how each mobile platform works, but also how consumers interact with them. Understanding mobile trends among consumers can help you tailor your ad spend accordingly. According to a 2015 Nielsen report cited by TechCrunch, consumers spend over 85 percent of their time on mobile in apps. The growth of app usage has been astronomical, rising by 63 percent in just two years. Clearly, you need to be taking advantage of consumers' ravenous appetite for apps by engineering app-related campaigns. The study also found that 84 percent of the app users' time is spent in just five apps. These vary from person to person, but chances are high that they're hanging out on some of the leading apps. 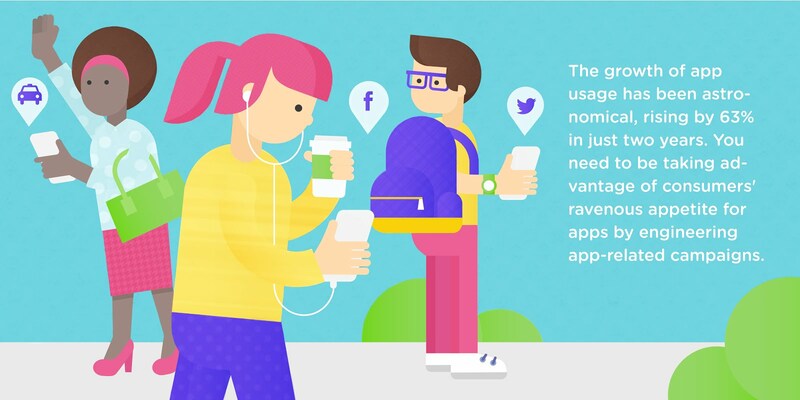 Time identified Facebook, YouTube, Google, and Instagram among 2015's most popular apps. Pushing content through these apps seems like an obvious move, but you may also want to put some ad spend into your own branded app, so that consumers have a secure mobile platform with which to engage with your brand in their preferred way. Consider putting ad spend behind social media campaigns if you want to maximize your mobile marketing and connect with consumers. While Facebook is by far the most popular social media site and app, with over one billion users, Instagram (the subsidiary of Facebook, recently stated it has 500 million users, 300 of whom are active daily) may be more useful to the mobile advertiser. Unlike Facebook, Instagram is innately mobile and functions best on a mobile platform (e.g., you can't upload a photo onto Instagram from your laptop—only from your mobile device). Instagram's location tagging feature is one that location-based mobile marketers may find especially useful. One fun way to tie this function into your Instagram campaign is to arrange a scavenger hunt—either real or virtual. Reebok launched a virtual San Francisco scavenger hunt campaign in spring 2015. According to Campaign Live, "Hunt The Pump" enabled users who followed @zpump_startingline to access a grid of photos with the Reebok pump logo hidden in it. A "like" and click on the logo took the user to the next mapped destination on their run, where they could click on another logo. Those who completed the race entered a contest to win a pair of sneakers. That this campaign tied in elements of gaming is part of what makes it noteworthy. According to research by Mintel, nearly half of Americans play video games on mobile devices—another potentially powerful avenue for ad spend. According to Pew Research Center, 97 percent of Americans text at least once a day. That's a staggering number, but it doesn't necessarily mean you should pour half of your of ad spend into SMS campaigns. Remember that people use text messaging for essential and constant communication with their friends and family, and shooting them an ad via this platform can be a major nuisance—though some brands do use it to good effect. One of the best ways to use SMS/text messaging is to build a customer loyalty program like Jamba Juice's. According to Tatango, the smoothie chain recently reached one million opted-in subscribers. The SMS loyalty program lures customers in by offering them three dollars off their next in-store purchase, once they've opted in with their phone number and email. When you're spending at least five dollars on a product, that's a pretty enticing deal. Better yet, customers can keep using the SMS program to build up Jamba Juice points. The real winner, of course, is Jamba Juice, who now has over a million people's numbers and emails, which they use to better understand their patrons and shoot them relevant offers down the road. 1. Take advantage of the staggering amount of time people tend to spend in apps. 2. Reach out to your audience via interactive social media campaigns. 3. Consider investing in a rewards program to bring consumers into your physical locations.